There is no doubt that a book that clearly sets out the principles of malpractice law would be helpful to the medical profession. The question is - is this the book? In the second sentence of his introduction the author states that the book, by virtue of the subject material, is primarily a legal work, and he is correct. He is obviously an expert in the field, and the subject of litigation is extensively and well covered. While academic in nature this is clearly not a reference book, making it less likely to be of use to those lawyers already experienced in the field. For lawyers it seems aimed primarily at undergraduates or those considering or entering the field. Would I advise doctors to acquire the book? I found one of the forewords a little misleading in stating that layman's language is used. The language used in the book is laboured, legalistic and difficult to follow. It is perhaps unfair to quote out of context, but a sentence among many that illustrates the point reads: 'Conduct may therefore be described as delictually unlawful only if it has as its consequence the factual infringement of an individual interest.' I think that for the average practitioner the principles, while set out, are opaque and difficult to understand. I suspect that most would not be able to distinguish the difference between negligence and malpractice. In addition, the book concentrates on litigation and is virtually silent on the regulatory consequences of malpractice or possible criminal involvement of the practitioner. The Health Professions Council of South Africa is a very important player in the South African medicolegal arena, and it is virtually unmentioned. Would I suggest that doctors who give expert opinions acquire the book? Latin terminology, foreseeability and lawfulness, while doubtless of legal significance, have little to do with where medicine meets the law, as opposed to the law meeting medicine. The vast majority of opinions that we seek revolve around evaluating the standard of care in a case, causation, prognosis, costs or life expectancy. Does the care given fall within the recognised and accepted practices of the profession? If it doesn't and the patient suffered harm, was the harm suffered as a result of the lapse in care or not? If experts can opine on these issues, the lawyers can take the arguments back to the law and legalese. The book gives little pragmatic advice in these important areas for medical experts. It is not a book that I would recommend to a medical practitioner expressing an interest in giving expert opinions. 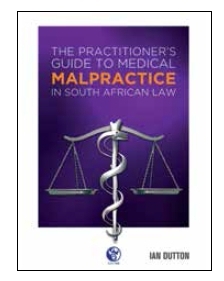 So in answer to the question whether this is the book to answer the medical profession's quest to understand malpractice law in South Africa, the answer is sadly probably in the negative. While it is packed with facts and written by an expert, the principles and pragmatic advice that doctors (even experts who give medicolegal opinions) need are probably too well hidden. To my mind the book is primarily for lawyers, and of limited interest to the medical profession.